Tue., Jan. 12, 2016, 8:47 p.m. When Sam Wood won Ben Wick’s Spokane Valley City Council seat by less than 1 percentage point this fall, it shifted the majority on the Valley City Council from conservative to more conservative. Wood’s win also means the Valley’s 90,000 residents are now represented by seven white men who are all over the age of 62, most of whom live in the same part of the city. Councilman Ed Pace said he worked very hard to create the new council makeup. Pace campaigned for both Wood and for Deputy Mayor Arne Woodard, who beat Tom Towey in the November election. The new council majority wasted no time in making its presence known. At the first meeting this year, the council passed a resolution introduced by Pace stating that Spokane Valley is not a sanctuary city for people living in the country without legal permission. It was an unusually contentious session. Pace, Wood, Woodard and newly selected Mayor Rod Higgins make up the far-right-leaning majority on the council. The less-conservative council members are Dean Grafos, Chuck Hafner and Bill Gothmann. Hafner and Grafos were both surprised by the immigration resolution. Hafner said he’s worried surprise resolutions will become a common way for the majority to push through new policy. Hafner said presenting a resolution in that manner – which does not violate City Council procedures – excludes legal staff from examining it and effectively cuts off opportunities for public input. Spokane Valley council members are elected at large and then select a mayor once the council is seated. Women have served on the council – among them Diana Wilhite who was mayor from November 2004 through December 2007 – but there were no female candidates in the latest election. The council’s policy is to leave political affiliations at home and not endorse political candidates or petitions. Council members all cite a “gentleman’s agreement” to avoid injecting party politics into the decisions they make on the council. But with the switch in power, the minority worries the nonpolitical days are over. “When you inject politics into local government whose job is economic development, safety and jobs, then I don’t think you serve the people of the Valley,” Grafos said. He added that the minority “over-dramatized” Pace’s resolution, which he said was simply an affirmation of where the council stands on immigration issues. Sanctuary cities have laws that in various manners shield undocumented immigrants from prosecution. Pace’s resolution states that Spokane Valley is not a sanctuary city; that the police department should be directed to assist other law enforcement agencies in enforcing U.S. immigration laws; and that police officers and city employees are directed to ask for proof of legal residency in the U.S. when appropriate. At the meeting on Jan. 5, Grafos said he was disappointed to see Pace politicize the issue. “This is bigotry right here in the Valley,” he said. Hafner warned that the resolution would inevitably lead to racial profiling. 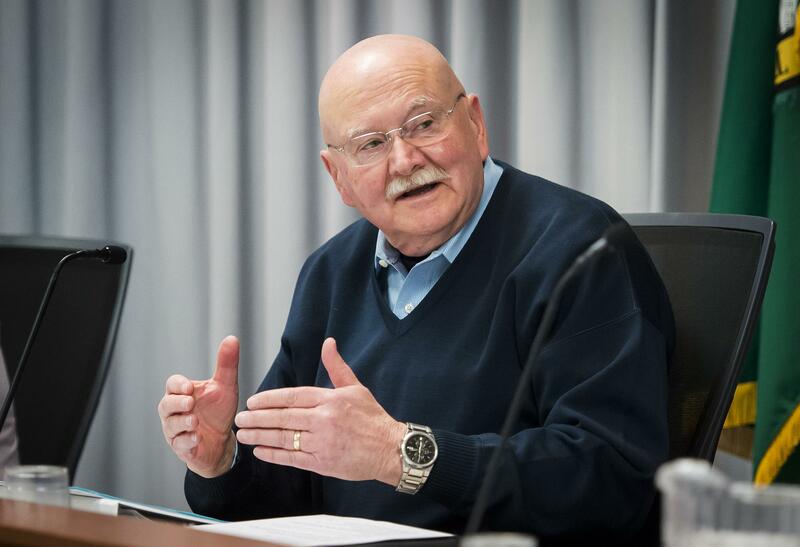 Spokane Valley is the 11th-largest city in Washington, and Higgins, as mayor, said he believes council members need to talk out some issues privately to prevent meetings from getting out of control – a clear violation of the state’s Open Public Meetings Act. Higgins has in the past been critical of that law and said it irks him that people have a “negative, knee-jerk perception” when they see two or three council members talking outside of a meeting. For his part, Wood said he was surprised by the tone and how personal some of the remarks were at his first meeting as a council member. There is no shortage of hot-button issues coming the council’s way in the near future, starting with hearings on the impact of a proposed oil terminal in Vancouver, Washington. The terminal would bring extra trains carrying oil through Spokane Valley every day, adding to the large number of trains already traveling on the Union Pacific and BNSF Railway Corp. tracks that bisect the city. Wood said he’s not worried about spills from the trains, but he is worried about the big increase in train traffic. “The trains are good for commerce; I don’t know that we can stop them,” Wood said. Like the rest of the council, Wood believes building bridges or underpasses through the Valley should be a high priority. He’s not sure where the money to build them would come from, however, with some projects of that magnitude costing $20 million or more. Pace has said many times that Spokane Valley should not be the city that “holds up the trains.” He’d like for the railroads to take the issue more seriously and perhaps pay a larger share of the bill. Grafos, who was mayor the last two years, said he’s pushed for the Pines Road underpass for years but has not made much progress. Another local issue that previous councils have discussed is the creation of a historic preservation ordinance. At a council meeting late last year the ordinance, supported by the previous majority, was sent on to the planning commission for review. At Tuesday’s meeting, however, Deputy Mayor Woodard asked to have the ordinance brought back before the City Council. Higgins said that’s a smart move because now is not the right time to adopt a historic preservation ordinance, as it would take too much staff time and council attention away from passing an update to the state-mandated comprehensive plan. “We need to focus on that now,” Higgins said. According to the city, “The comprehensive plan is the city’s official statement concerning its vision for future growth and development.” It must be updated by mid-2017. Spokane Valley incorporated in 2003, and the city’s population has increased by about 10,000 people since then. Currently, council members are elected at large, but Grafos said it may be time to look at election by district to ensure representative government and encourage more participation. Pace is fond of saying that he represents everyone in the Valley. Grafos said Spokane Valley residents tend to be fiscally conservative but have a large array of opinions. “I don’t think Ed represents all of them,” Grafos said. Wood, who just ran a campaign, said it would be cheaper to campaign in a smaller district and it would allow a council member to connect better with constituents. “The downside would be that you get too narrowed-down in your thinking,” Wood said. Wood plans to walk the neighborhoods, knocking on doors and talking to people, much as he did during his campaign. Published: Jan. 12, 2016, 8:47 p.m.